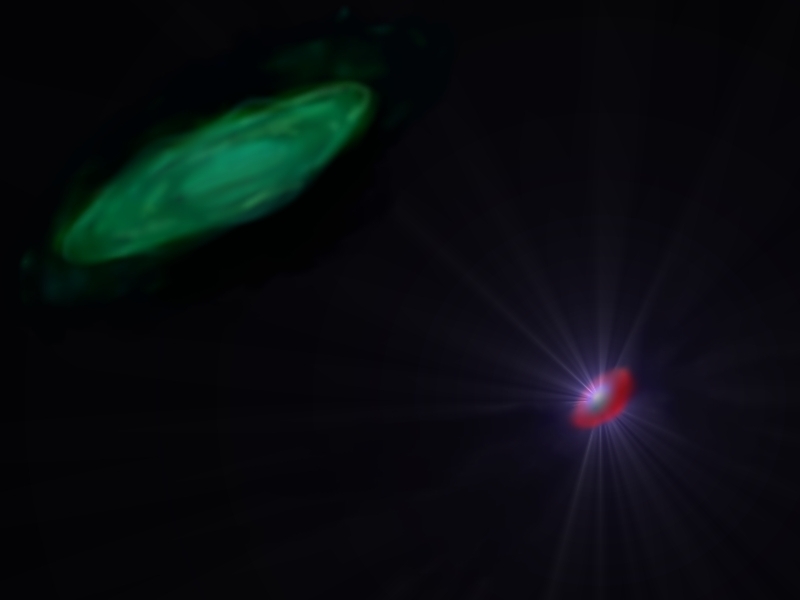 Astronomers using the National Science Foundation's Very Large Array (VLA) radio telescope have discovered a massive reservoir of cold gas from which a primeval galaxy formed its first stars. Looking more than 12 billion years into the past, the scientists found that the young galaxy experiencing a "burst" of star formation was surrounded by enough cold molecular gas to make 100 billion suns. "This is the first time anyone has seen the massive reservoir of cold gas required for these incredible 'starbursts' to produce a galaxy," said Chris Carilli, an astronomer at the NSF's National Radio Astronomy Observatory (NRAO) in Socorro, NM. "There is much more gas here than we anticipated," Carilli added. The research team was led by Padeli Papadoupoulos of Leiden Observatory in the Netherlands and also included Rob Ivison of University College London and Geraint Lewis of the Anglo-Australian Observatory in Australia. The scientists reported their findings in the January 4 edition of the journal Nature. The astronomers found the gas when studying a quasar called APM 08279+5255, discovered in 1998. Observations with optical and infrared telescopes revealed that the quasar, a young galaxy with a voracious black hole at its center, was forming new stars rapidly in a starburst. At a distance of more than 12 billion light-years, the quasar is seen as it was more than 12 billion years ago, just a billion or so years after the Big Bang. "This thing is at the edge of the dark ages," before the first stars in the universe were born, said Carilli. The year after its discovery, APM 08279+5255 was found to have warm carbon monoxide (CO) gas near its center, heated by the energy released as the galaxy's black hole devours material. 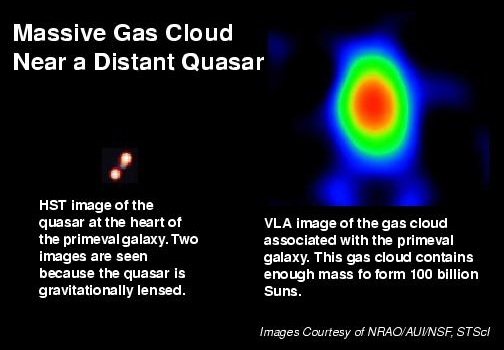 The VLA observations revealed cold CO gas much more widely distributed than its warmer counterpart. Based on observations of closer objects, the astronomers presume the CO gas is accompanied by large amounts of molecular hydrogen gas (H2). Cold CO gas never has been detected before in such a distant object. Though APM 08279+5255 is a young galaxy undergoing its first massive burst of star formation, the CO gas indicates that very massive stars formed quickly, lived through their short lifetimes, and exploded as supernovae. Carbon and Oxygen, the component elements of CO, are formed in the cores of stars, so their presence in the cold gas tells the astronomers that massive, short-lived stars had to have exploded already, spreading these elements throughout the galaxy's interstellar gas. "The original discovery of this quasar was quite a surprise, as observations revealed it is among the most luminous objects known in the universe. The discovery of this massive reservoir of cold gas is equally surprising. It provides vital clues to the birth of galaxies, such as our own Milky Way," Lewis said. Discovery of the gas was made possible by the galaxy's great distance. The expansion of the universe "stretches" light and radio waves to longer wavelengths -- the more distant the object, the more stretching is seen. Radio waves emitted by the cold CO gas originally had wavelengths of about 1.3 and 2.6 millimeters, but were "redshifted" to wavelengths of 7 and 13 millimeters -- wavelengths the VLA can receive. "It took eight years to refine this technique, but the effort has been worthwhile. This is the golden age of cosmology. We are learning more and more about our universe, from the smallest planets to the largest galaxy clusters. This new result is a crucial piece in the jigsaw and may help resolve many misconceptions about how galaxies form and evolve" Ivison said. "Because of its sensitivity and its ability to make detailed images, the VLA is the only telescope able to unveil these large reservoirs of cold molecular gas in the distant universe," Carilli said. "In addition, as we expand the technical capabilities of the VLA in the coming years, making it even more sensitive and able to show more detail, it will become the world's premier tool for studying this vital aspect of the young universe." Artist's conception of the APM 08279+5255 system, with the bright quasar at right, the large, massive gas cloud on the left. CREDIT: Geraint Lewis. CAPTION for composite graphic at top of story: Radio and optical images of APM 08279+5255. Both images are at approximately the same scale. Radio image by P. Papadoupoulos, R. Ivison, C. Carilli and G. Lewis; Optical image by R. Ibata.